Bring 1 cup of water to a boil in a small saucepan. Add bouillon cube and stir to dissolve. Simmer 15 minutes. Preheat oven to 400 degrees F. Coat a large baking dish with cooking spray; set aside. In a large bowl, mix together all ingredients except the marinara sauce, cheese and parsley. Form into walnut-sized balls and arrange on baking dish. Roast in oven for approximately 20 minutes or until cooked through and golden brown. Spoon sauce on top, then sprinkle with cheese; bake an additional 5 minutes or until sauce is hot and cheese is melted. Remove from oven and sprinkle with parsley. 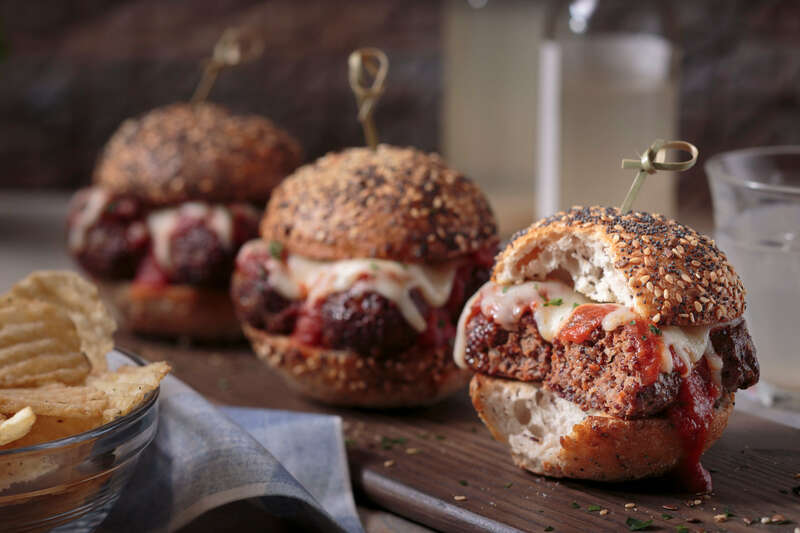 Make sliders by slicing a dinner roll in half and placing meatball on top, sprinkle with fresh Parmesan cheese for extra flavor..